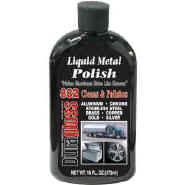 Duragloss® Liquid Metal Polish is formulated to clean and polish chrome and aluminum surfaces - effortlessly. It removes oxidation, tarnish, rust and soil - fast! Makes aluminum shine like chrome. Also cleans silver, gold, brass, pewter, stainless steel and copper. "Makes Aluminum Shine Like Chrome"